A good ground connection is every bit as important as a good antenna in do-it-yourself radio electronics. The best way to create a good ground connection is to use a metal cold water pipe. If you can’t find a water pipe, get a length of metal rebar and pound it into the ground. The deeper you go, the better the ground connection. 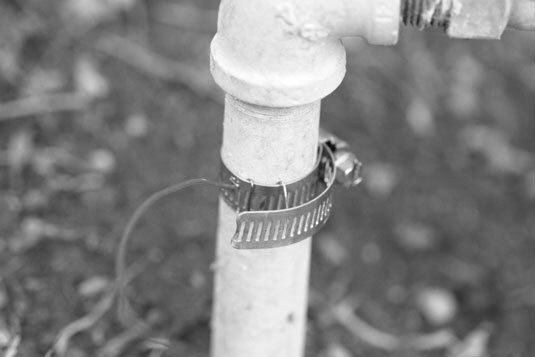 The easiest way to connect a wire to a water pipe (or a piece of rebar) is to use a pipe clamp, which you can find in the plumbing section of any hardware store. Use some coarse sandpaper to sand the pipe where you attach the clamp to improve the electrical connection, especially if the pipe has been painted or varnished. Strip an inch or two of insulation from the end of your ground wire and wrap it around the clamp, then slip the clamp around the water pipe and tighten it down.